I called this post "Dance of the Lampshades" because it sounds a little classy -- like maybe it's some forgotten sequence from The Nutcracker. Really, though, it should be called "Musical Lampshades," as in the game of musical chairs. Or maybe "the Lampshade Reel," like the Virginia Reel dance in Gone With the Wind...bow and switch partners, doe-si-doe. And here we go. See if you can keep track, because it's confusing enough to me. I bought it on Ebay many moons ago, at the height of my mid-century phase. I still like mid-century design, but a few years ago I was going more for the hard-core retro look. I won the shade, and it's little brother (the same shade, only shorter and smaller) in an auction. And then I went back on Ebay to find a lamp to go with my retro-licious tiered shade. I bought this teak and ceramic lamp, and like the shade, it came with a sibling, this time a twin brother. I didn't need 2 of the exact lamp, so one went into the closet. And then I had this. Voila! Back when I had pumpkin paint in the family room. Then last year, we painted and re-did our master bedroom. I went to Home Goods and bought a pair of lucite lamps for our new bedside tables. I liked them, except that they came with bright lime-green shades, and the colors in our master are grey and yellow. So I searched around for some rectangular white shades (a shape that's harder to find than you'd think). Surprisingly, I found something close to what I wanted at Wal-Mart. These shades were $8 each. These shades are a bit too small; the lamps came with harps and a nice lucite ball finial, which I can't use with these. It's on my Master List of 2012 to buy some proper-sized shades. And that was pretty much the end of the story for a good while. Until a few weeks ago, when I did another swap. 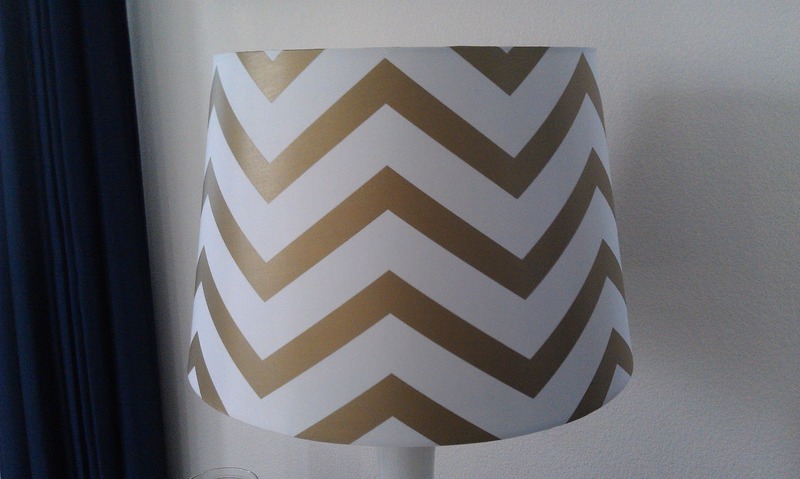 I'd bought a lampshade I loved, the Target one with gold chevron stripes. I didn't have a lamp for it, but you know how it goes at Target: when it's gone, it's gone, so gather your lampshades while ye may. The teak lamp had been moved temporarily from it's mate in the family room, to this brown table in the living room. One of those Christmas decorating switches. The white lamp came with that groovy big shade with the blue graphics, sitting on the chair. I like it a lot, but for now it's in the closet. After I paint my living room (another story), I have a feeling it may come out, and replace the tiered-retro shade on the floor lamp. Why are good lampshades and lamps sooooo hard to find, and even harder, to find together? I have been in a spiral of lampshade/lamp combo switching for years, and still have a couple that are not quite right. Yours look lovely! I am quite fond of the teak and ceramic pair. Thanks for the fun post! Thank you! Good lamps & shades are easy enough to find...but finding them at a price I can afford is the real problem! I'm also very fond of the teak pair. Love the lampshade dance! We really need some better lamps in our family room and living room (we're still rocking the Ikea ones from our single days), but I'm too cheap to make it a priority. Always something more urgent to get to. Thanks, Melissa. Somehow, for all the many, many Ikea items in my home, I don't have much in Ikea lighting...mainly the kitchen fixture above my sink. I love that gold chevron lampshade. I need lamps for my bedside tables & have high hopes I can find something at Target. I better, as it's a 3 hour round trip. 3 hours away?...I would die! ;-) (But my bank account would be a lot healthier.) Good luck, hope you find something that works. Hi! I love this--it's just what happens, sometimes! Personally, I'd try out that funky drum shade currently in the closet ith the uplight--on my screen the shade looks like it's silver or gry--I think that ould look terrific with the silver in the uplight. As ell, the shade you showed us looks a teensy bit small for it. Found you via Jules and P&FF. Alana, the pattern on the unused drum shade is actually a deep navy blue, which won't at all match the green/aqua scheme going on in the great room/kitchen area. I agree that the current shade on the silver floor lamp is a bit small...but eh. For now, it works! Thanks for stopping by. Lampshades are a total pain (these things are not taught in school ;)). All the switching and purchasing has paid off. 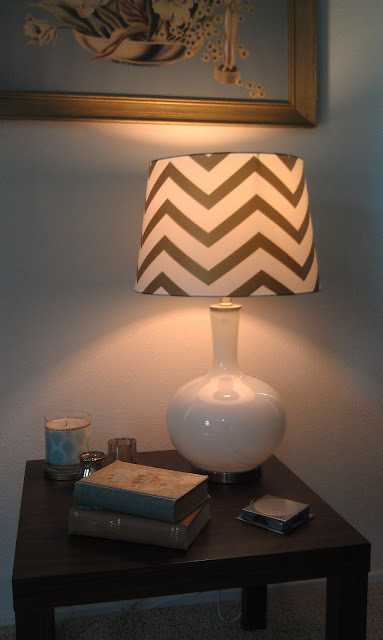 The teak retro lamps are lovely, but that chevron shade is really great. Wish that Target would just get to Canada already. You have my deep sympathies, with no nearby Target. That just seems so wrong! I am so fixated on the mid-century lamps and shades. I have to keep scrolling up and looking again. Those are in picture perfect condition. I am in awe. It never ceases to amaze me the huge difference a perfectly placed lamp can make.